Happy New Year! I was seeking inspiration on what to make and decided to pick from something from the New Items section on the Milk and Eggs homepage. A chili sauce caught my eye, so I built this post around that! I hope you enjoy my spontaneous creation! 1. 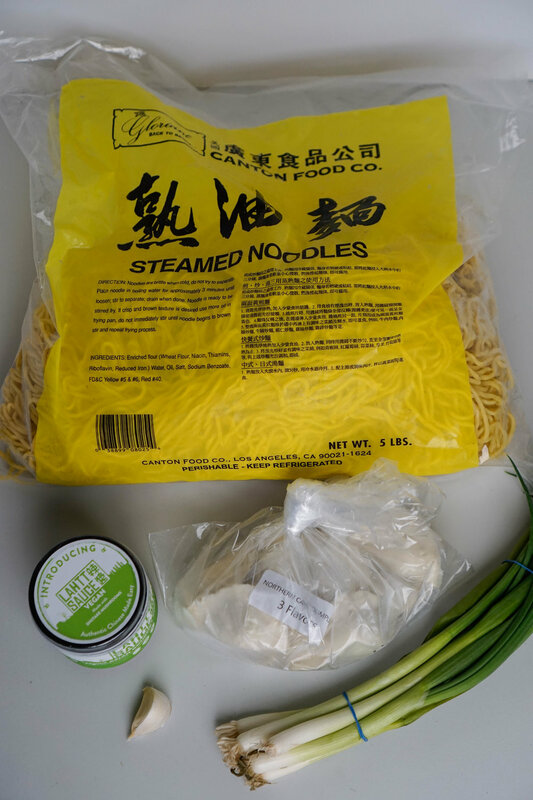 Boil water and cook two handfuls of the steamed noodles for 3 minutes. 2. In the meantime, heat some oil on a pan and sautee the garlic until fragrant and slightly browned. Add in the green onions and stir fry for 1-2 minutes or until the color of the onions is vibrant. Set aside. 3. Set aside the steamed noodles and cook the desired number of frozen dumplings for 3 minutes. 4. Heat up the pan and add in the cooked noodles and the chili sauce. Mix well and add in the vegetable mixture until everything is coated evenly. Remove from the heat and serve with the cooked dumplings.